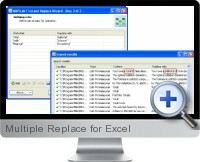 Multiple Replace for Excel allows data to be replaced within multiple Excel documents based on multiple and flexible criteria. Simultaneously run find and replace routines on several files or partial files (worksheets). Save and download replacement routines as templates for reuse. Create an unlimited number of rules for search and replacement of data and their simultaneous implementation. Set up conditions of the Find and Replace functions using regular expressions and wild cards.